First off, I lied. We don't have a dog so the heart attack never happened but if we did have a dog and if it had the ability to read, I'm sure its heart would've stopped if it was forced to read the following synopsis from a Filipino movie which is currently showing in cinemas nationwide. 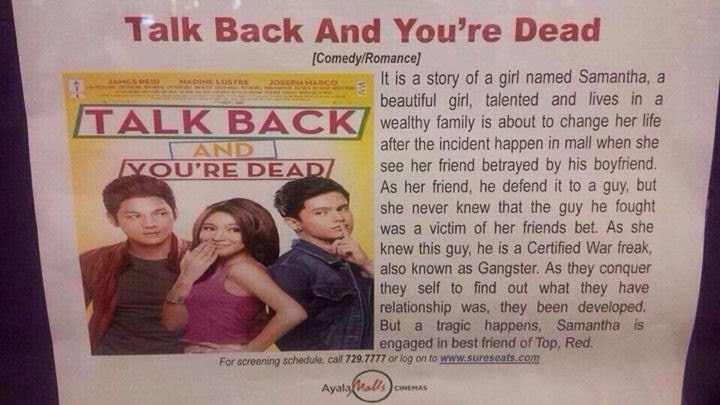 Talk Back and You're Dead is a Filipino romantic comedy about....well....I have no idea what it's about because the synopsis given is a jungle of unintelligible phrases. Apparently, this photo was taken at an Alabang Town Center cinema. It makes you wonder if the people behind this atrocity have an editor or at least a proofreader. Or maybe they have one, one who just graduated from kindergarten. The movie was reportedly based on a popular online novel of the same title posted on the writing site Wattpad. The Philippine movie industry has been on a decline for like over a decade now. Most Filipino movies that get shown nationwide these days are crap. And a lot of them were based on stories that first gained popularity in online social sites like Wattpad. Fortunately, there are great independent Filipino films out there who are keeping the hope alive. What's unfortunate is that the directors of these good films are often stuck making indie films that get very little exposure because they get very little support.